While in Boston for business, attorney John Mason (Stewart) marries Jane (Lombard) after only knowing her for a few days. Not everyone is excited about the new couple’s marriage. John’s demanding boss, Judge Doolittle (Coburn), isn’t a fan of the marriage and doesn’t approve of honeymoons. 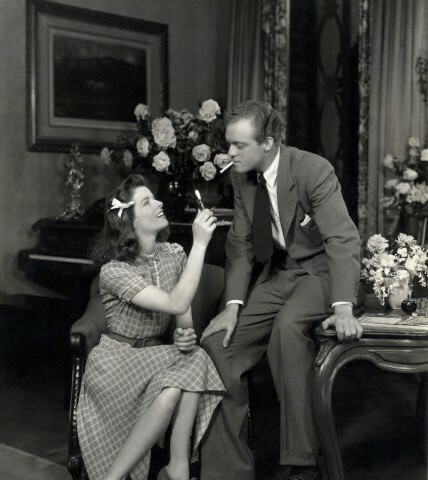 Gossip also paired John with Doolittle’s daughter, Eunice (Weston). John’s mother (Watson) also passed out dead in a faint and is critical of everything Jane does. The couple faces tensions as they get to know each other, particularly with John’s job. The couple has a baby and on New Year’s Eve of 1938-39, the child comes critically ill. When a senator dies, corrupt political boss Jim Taylor (Arnold) needs to fill the position with someone he can control. Patriotic but unexperienced Jefferson Smith (Stewart) is appointed in the place by his governor (Kibbee) and he is guided by Senator Paine (Rains), who is also controlled by Taylor, in his journey to Washington, D.C. Smith’s secretary Clarissa Saunders (Arthur), thinks Smith’s patriotism is bunk and tries to railroad him with a bad press story, but once she sees he is sincere supports him. While Smith is supposed to be a “Yes” man, he becomes determined to fight the corrupt senate politics. Larry Hall (Stewart) and Eddie Burgess (Ayres) are a successful ice skating act until Larry and Mary Mckay (Crawford) fall in love and she’s included in the act as a singer. The trio fails and they lose their job. Larry and Mary gets a job as an actress in Hollywood to help support them. She doesn’t realize until later that her contract says that she isn’t allowed to be married without the studio’s consent. Larry can’t handle both their fame and their secret marriage. He leaves saying he will return when he makes a success with ice capades show. Wealthy Willie Heyward (Treux) is accused of murder and his private detective Guy Johnson (Stewart) is arrested for obstruction of justice for hiding Heyward after the murder. Johnson escapes the police by jumping off a train, and poetess Edwina Corday (Colbert) witnesses his escape. Guy kidnaps Edwina so she won’t report him to the police as he tries to continue to clear Heyward of murder. • Sandra (Lamarr), who is discovered while she is with her violinist husband (Dorn), who is auditioning for the orchestra. The film follows the girls as they rise to fame and the trials they face on their way up: alcohol, wooing men who try to take them away from husbands and boyfriends and getting accustomed to more money. They all learn that fame has a great price. -Florenz Ziegfeld was a famous Broadway producer who died in 1932. He was known for his lavish sets and elaborate costumes that “glorified the American girl.” Ziegfeld is a God-like figure in this film: he is discussed but never seen. -“Ziegfeld Girl” is one of three films MGM dedicated to Florenz Ziegfeld. This film is a follow up to “The Great Ziegfeld ” (1936), a biopic of Ziegfeld starring William Powell as the impresario. “Ziegfeld Girl” is a sequel which shows the life of the Ziegfeld Girls. The third film was “Ziegfeld Follies ” (1946), which just showed multiple Ziegfeld-like acts. -Hedy Lamarr requested to be in this film as a change of pace from her other dramatic roles, according to historian John Fricke. -Two of the actors in the film were in original Florenz Ziegfeld produced films: Charles Winneger, who was in the original stage production of Show Boat, and Al Shean, who was part of the act Gallagher and Shean. 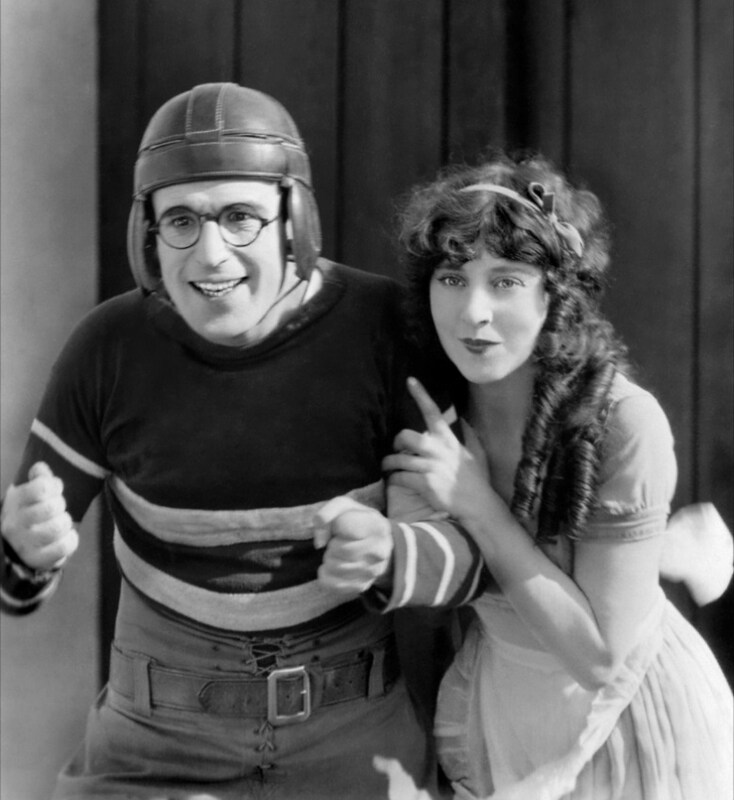 Winninger and Shean recreate one of the Gallagher and Shean numbers in the film. -The production of this film was originally announced in 1938 and was to star Eleanor Powell, Joan Crawford, Margaret Sullivan and Virginia Bruce (who was in The Great Ziegfeld). It was several years before the script was developed and the film was recast with newer talent, according to film historian John Fricke. -James Stewart’s last film before joining the military to fight in World War II. His next film was “It’s a Wonderful Life” in 1946. -The finale of “Ziegfeld Girl” edits in multiple numbers from “The Great Ziegfeld.” Judy Garland’s character is dressed in a costume which recreates the “Pretty Girl” number from the 1936 film, on top of the large tower. 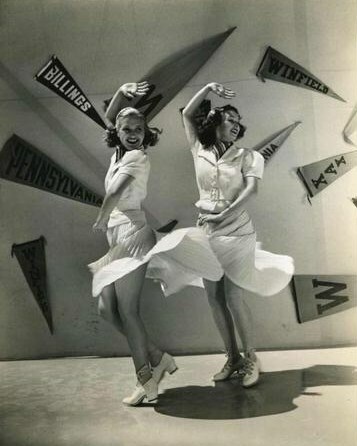 -Busby Berkely choreographed the numbers in the film. 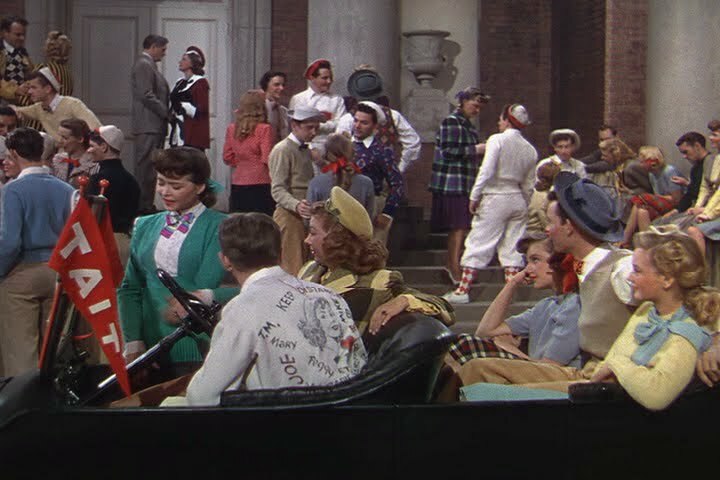 -The original finale was going to be “We Must Have Music” with Judy Garland, but it was deleted. -Judy Garland felt a little inferior to her co-stars. A frequent story she shared was: When Lana Turner came onset, the technicians would whistle. When Hedy would pass through, they would sigh. When Judy came on set they would tell her hello, according to “Beautiful: The Life of Hedy Lamarr ” by Stephen Michael Shearer. -“Ziegfeld Girl” was the game changer in Lana Turner’s career, and it led to more serious, dramatic and adult roles. The role was even expanded for Turner during filming. -Lana Turner was originally supposed to die at the end of the film, according to TCM film historian Robert Osborne. Her death had negative reactions from preview audiences and is now cut to be left ambiguous. -Model and later wife of Kay Kyser, Georgia Carroll, said in 2008 that Hedy Lamarr was shy and private during the filming. Hedy Lamarr and Judy Garland were friends and Lamarr and Lana Turner were cordial, according to “Beautiful: The life of Hedy Lamarr” by Stephen Michael Shearer. In the grand scheme of film history, “Ziegfeld Girl” (1941) may not be very important. It is notable because it gave Lana Turner’s career the boost it needed, landing her in more sophisticated and adult roles. But when it comes to Metro-Goldwyn-Mayer movie musicals, this one isn’t even listed in the top 10. But I love it. “Ziegfeld Girl” may be overly long (with a run time of 2 hours and 12 minutes) and the plot may be rather fluffy, but I think it’s a great example of the lavish luxury that was a Metro-Goldwyn-Mayer film. With the Adrian gowns and themes of fame and newly found wealth, “Ziegfeld Girl” oozes glamour, sophistication and the jewel-encrusted style many people dream about. For some reason, for me, this film holds the definition of MGM glamour more than other well-known MGM films like “Singin’ in the Rain” (1952), “The Women” (1939) or “Grand Hotel” (1932). I think one major reason for this is the “You Stepped Out of a Dream” number where Tony Martin sings as women in elaborate (yet eccentric) costumes walk up and down stairs like goddesses. After it’s release, Hedda Hopper said that the film is so beautiful that it “makes you ill that it’s not in color.” I can’t say I agree though. While Technicolor would have made “Ziegfeld Girl” even more glorious, I somehow think that black-and-white suits it and glitters more than color would. Color would have almost been too distracting. The cast of this film is also bursting at the seams. Not only are the leading ladies three of MGM’s most well-known and top stars, the character actors seemingly just keep coming out of the woodwork through the film. I do also enjoy that two original Ziegfeld players- Charles Winninger and Al Shean- are included in the film. I first saw “Ziegfeld Girl” in 2004 or 2005 and I fell in love with it and I still really love this movie. I loved it so much that “ziegfeldgirl1941” was part of my e-mail address at the time. I even tried to convince my mom to play “You Stepped Out of a Dream” when I walked downstairs to my prom date (she refused so this didn’t happen). If the glamour of this film was a soap or a perfume, I would buy it and wear it. But since it’s not, I did the next best thing. I created Hedy Lamarr’s “Stepped out of a Dream” costume designed by Adrian for this Halloween. I bought the sleeveless white dress but made the rest of the costume- sewing on sleeves, cutting out and gluing silver stars and sequins, using 12 glue sticks to attach the wire with stars on a board on my back (Adrian also used a board on Hedy’s back.) If this 20-hour project doesn’t describe my love for “Ziegfeld Girl,” I’m not sure what does. If you love MGM glamour and musicals, I would give this one a watch. I’ll give you fair warning that it’s a bit dramatic in parts, like when Lana Turner’s luck starts to change, but it’s such a fabulous look at MGM in it’s prime. “The Philadelphia Story” taught me what a hangover was when I was nine. And who knew what yare meant before Katharine Hepburn used the word? My fourth grade education was enhanced when I learned the meaning of those words the first time I saw “The Philadelphia Story” (1940) in 1998. My dad was out of town one summer evening and my mother, sister and I picked a movie to watch. We loved it. “Why did she shield her eyes from the sun like that?” I asked my mom. She explained the consequences people face the next morning after drinking too much. For years after, I even tried to imitate Hepburn’s silly little laugh she does in the film. I had forgotten not only about my new vocabulary words the first time I saw the film but many of the charming scenes in “The Philadelphia Story” until I saw it last night for the first time on the big screen. I drove an hour to my hometown of Greenville, SC where outdoor classic films are shown every week in May at the Reedy River Falls Park. Classic film screenings are a treat for me. 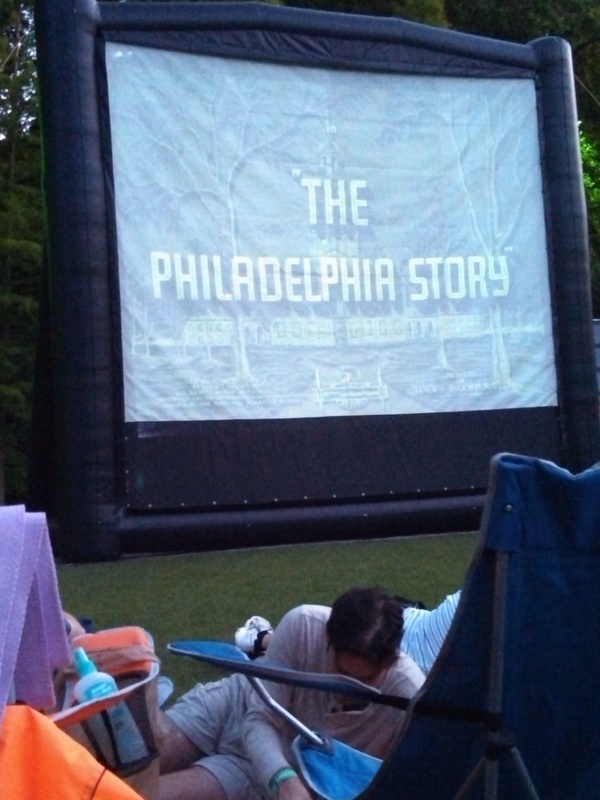 Where I live, viewing movies on the big screen is rare. It had been several years since I had seen this movie. 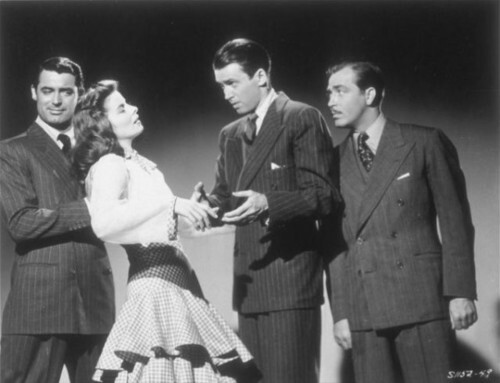 Though I knew it was good- boasting a cast of Katharine Hepburn, Cary Grant, James Stewart, Ruth Hussey, Virginia Weidler and Roland Young-I forgot how wonderful it really was. The leads are perfect in nearly every film but Virginia Weidler steals the show. On paper, the film sound dizzy: A divorced woman is remarrying, the ex-husband pops back in the picture and then a reporter-who already has a girlfriend-becomes a potential romantic partner. It’s a love pentagon. But somehow the story works when it’s acted out. The script of The Philadelphia Story was written specifically for Katharine Hepburn who originated the role on Broadway and reprised her role as Tracy Lord on screen. The film helped rid Hepburn of her box office poison status. In the play, Joseph Cotten played C. K. Dexter Haven (played by Cary Grant in the film version) and Macaulay Connor was played by Van Heflin (played by James Stewart). While watching the movie last night I couldn’t help picture those two performing those roles. I have only been to one other Moonlight Movie series in Greenville back in 2011 to see Strangers on a Train. It wasn’t a pleasant experience due to people talking and continuously getting up and down during the film. However, last night was much more relaxing and everyone was respectful of the movie. The only disappointing thing is no one applauded when the film started or when actors entered their first scene like at the Turner Classic Film Festival, however I heard several people around me say they had never seen the movie again. 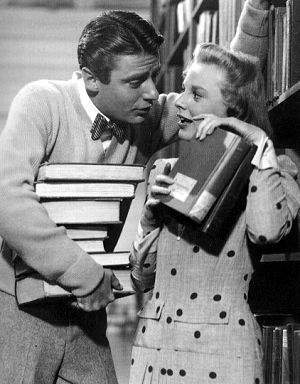 Revisiting “The Philadelphia Story” was fun and I reminded me how great a movie it was. I’m discovering seeing movies on the big screen is a very special experience. After all-they were made to be seen that way.